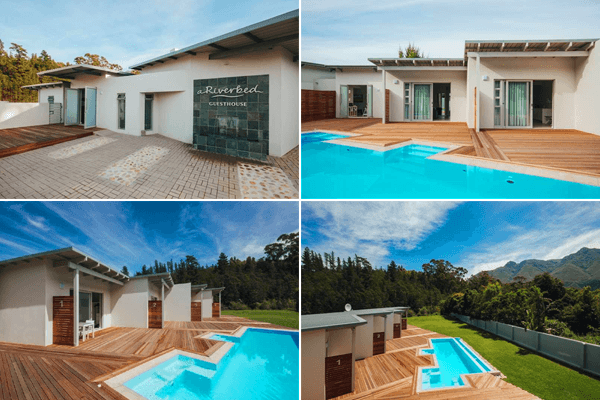 At the foot of the Langeberg mountains, in the breathtaking town of Swellendam is A Riverbed Guesthouse with 4 luxury suites next to the Koornlands river. Come and rejuvenate yourself at our peaceful ‘bed on the river’ and relax on the deck next to the endless pool. 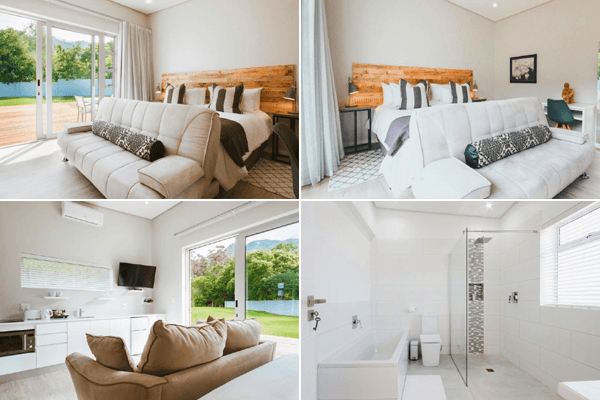 Our four suites are luxurious and fully equipped, each with beautiful mountain views and riverside tranquillity. 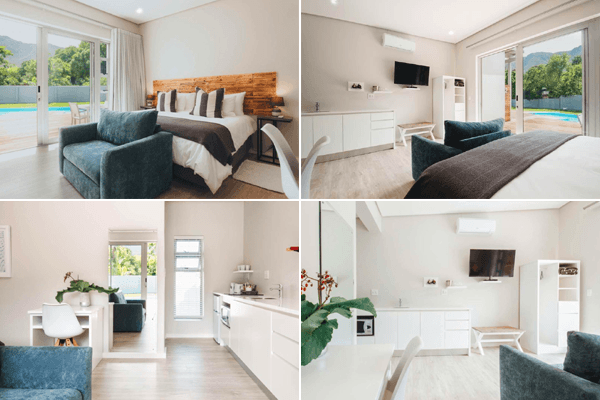 We are conveniently situated within walking distance of restaurants, shops and the Marloth Nature Reserve mountain trails. We regret no children under 16 years of age. 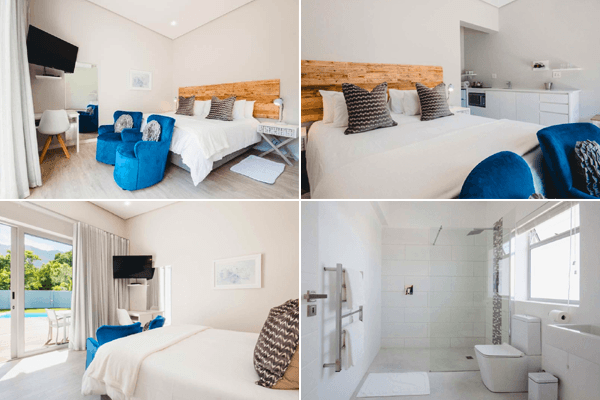 Each elegantly equipped suite comes with an air conditioning unit, a king size or two single beds, a 43 inch smart, ﬂat screen tv, couch/luxury chairs, a safe. Fully equipped kitchenette: snappy chef induction stove, microwave oven, basin, fridge with separate freezer. Heated towel rails in the bathrooms. Our rim ﬂow pool just outside your door, has an extended, jacuzzi style, jetted section, complete with seats. 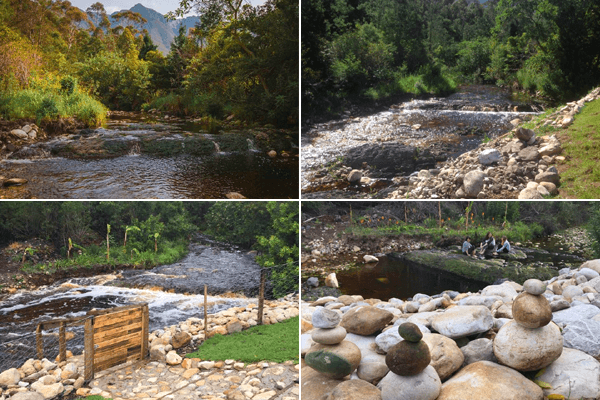 Swellendam is the perfect base from which to view the Overberg region and A Riverbed is centrally located in the town. For hiking and outdoor activities, visit Marloth Nature Reserve & Bontebok National Park. See the forests and hillside landscapes on horseback, with Two Feathers Horse Trails. For history buffs, a visit to the third oldest town in South Africa’s , Drostdy Museum is a must. And if you’re looking for a place to eat, there are many excellent restaurants nearby. The best way to see the town is on foot, so take a stroll down oak lined streets to the Drostdy Restaurant, Field & Fork or De Companjie or pop in to one of the coffee shops for breakfast or lunch. There are many fantastic day trips within an hour or two’s drive from Swellendam. Visit De Hoop Nature Reserve – For the ultimate whale watching experience, L’Agulhas – The Southern most tip of Africa, Some incredible wines on the Robertson Wine Route, take a dip in the Montagu or Warmwaterberg Hot Springs or drive the picturesque Tradouw Pass to artistic Barrydale. 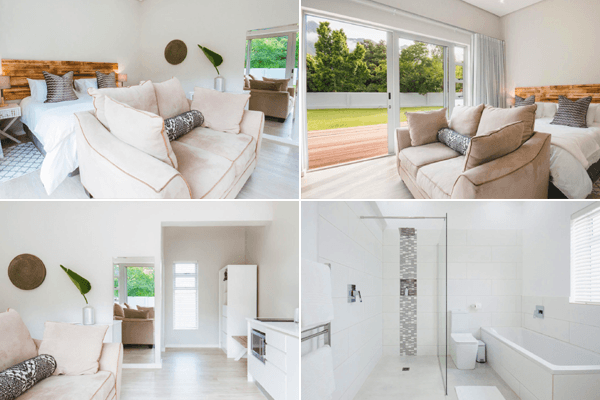 Some other things to do while you’re visiting Swellendam, Relax in the Rain Forest Day Spa, Sweet treats at the Bee Things Honey shop, or a round of golf at the 9 hole Swellendam Golf Course.